Create and add countdown timer in your sales pages, special offers, and time-limited events. Nothing to install. 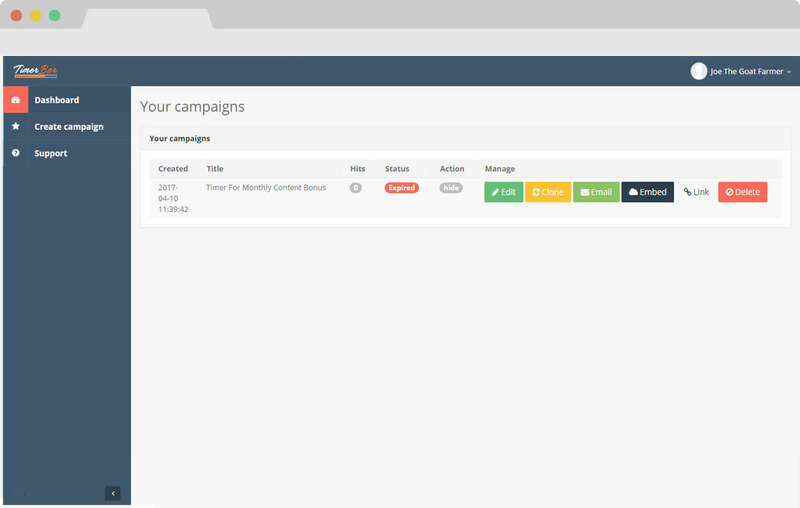 Just log in and create your TimerBar campaigns. Just add a few bits of info and your TimerBar campaign is ready. Add a TimerBar scarcity bar or countdown to your own site, or as a Smart URL overlay on any external site – perfect for affiliate promos. Customize all colours, fonts, graphics, text and links. TimerBar gives you 100% flexibility. Don’t lose sales from mobile users – TimerBar is responsive and will resize for any device. Create as many TimerBar campaigns as you like – no limit for our lifetime account customers.